The Guelphs and Ghibellines (/ˈɡwɛlfs ... ˈɡɪbɪlaɪnz/, also US: /-liːnz, -lɪnz/; Italian: guelfi e ghibellini [ˈɡwɛlfi e ɡɡibelˈliːni; -fj e]) were factions supporting the Pope and the Holy Roman Emperor, respectively, in the Italian city-states of central and northern Italy. During the 12th and 13th centuries, rivalry between these two parties formed a particularly important aspect of the internal politics of medieval Italy. The struggle for power between the Papacy and the Holy Roman Empire had arisen with the Investiture Controversy, which began in 1075 and ended with the Concordat of Worms in 1122. The division between the Guelphs and Ghibellines in Italy, fuelled by the imperial Great Interregnum, persisted until the 15th century. Guelph (often spelled Guelf; in Italian Guelfo, plural Guelfi) is an Italian form of the name of the House of Welf, the family of the dukes of Bavaria (including the namesake Welf II, Duke of Bavaria, as well as Henry the Lion). The Welfs were said to have used the name as a rallying cry during the Siege of Weinsberg in 1140, in which the rival Hohenstaufens of Swabia (led by Conrad III of Germany) used "Wibellingen", the name of a castle today known as Waiblingen, as their cry; "Wibellingen" subsequently became Ghibellino in Italian. The division developed its own dynamic in the politics of medieval Italy, and it persisted long after the direct confrontation between Emperor and Pope had ceased. Smaller cities tended to be Ghibelline if the larger city nearby was Guelph, as Guelph Republic of Florence and Ghibelline Republic of Siena faced off at the Battle of Montaperti, 1260. Pisa maintained a staunch Ghibelline stance against her fiercest rivals, the Guelph Republic of Genoa and Florence. Adherence to one of the parties could therefore be motivated by local or regional political reasons. Within cities, party allegiances differed from guild to guild, rione to rione, and a city could easily change party after internal upheaval. Moreover, sometimes traditionally Ghibelline cities allied with the Papacy, while Guelph cities were even punished with interdict. At the beginning of the 13th century, Philip of Swabia, a Hohenstaufen, and his son-in-law Otto of Brunswick, a Welf, were rivals for the imperial throne. Philip was supported by the Ghibellines as a relative of Frederick I, while Otto was supported by the Guelphs. Philip's heir, Frederick II, Holy Roman Emperor, was an enemy of both Otto and the Papacy, and during Frederick's reign the Guelphs became more strictly associated with the Papacy while the Ghibellines became supporters of the Empire, and of Frederick in particular. Frederick II also introduced this division to the Crusader states in the Levant during the Sixth Crusade. After the Sixth Crusade, Frederick II quelled a rebellion led by his son Henry in Germany and soon invaded Lombardy with a large Army. Pope Gregory IX attempted to stop the invasion with diplomacy but failed. Frederick defeated the Lombard League in the Battle of Cortenuova and refused any Peace treaty with any of the Guelph States. He then laid siege to Brescia but was forced to lift it. He was then excommunicated by the Pope, and in response expelled the friars from Lombardy and placed his son Enzo as Imperial vicar in Italy, he quickly annexed Romagna, Marche, and the Duchy of Spoleto as well as part of the Papal States. In the meantime Frederick marched through Tuscany hoping to capture Rome, however he was forced to retreat, sacking the city of Benevento. Soon however the Ghibelline city of Ferrara fell and Frederick once more marched into Italy capturing Ravenna and Faenza. The Pope called a council but an Imperial-Pisan fleet defeated a Papal fleet carrying Cardinals and prelates from Genoa in the Battle of Giglio and then Frederick continued marching towards Rome. However Pope Gregory soon died and Frederick, seeing the war being directed against the Church and not the Pope, withdrew his forces, releasing two cardinals from Capua, although Frederick did again march against Rome over and over throughout 1242 and 1243. A new Pope Innocent IV was elected. At first Frederick was content with the election since Innocent had relatives in the Imperial camp. However the new Pope immediately turned against Frederick. When the City of Viterbo rebelled, the pope backed the Guelphs. Frederick immediately marched to Italy and besieged Viterbo. The Pope signed a Peace treaty with the Emperor, relieving the city. However, after the Emperor left the Cardinal Raniero Capocci, as the leader of Viterbo, had the garrison massacred. The Pope made another treaty but he immediately broke it and continued to back the Guelphs, supporting Henry Raspe, Landgrave of Thuringia as King of the Romans and soon plotted to have Frederick killed. When the attempt failed the Pope fled to Liguria. Soon the tide turned against the imperial party as the Lombard city of Parma rebelled and Enzo - who had not been present - asked his father for help. Frederick and Ezzelino III da Romano, the Tyrant of Verona, besieged the city. However the imperial camp was ambushed by the Guelphs and in the ensuing Battle of Parma the imperial party was routed, losing much of their treasury. Frederick retreated and gathered another army but the resistance of Parma encouraged other cities to rebel and Frederick was powerless to do anything. Things became worse for the imperial party as the Ghibellines were defeated in the Battle of Fossalta by the Bolognese, at which Enzo was captured and imprisoned until his death. Although the Ghibellines did start recovering, defeating the Guelphs in the Battle of Cingoli, Frederick by then was ill. Before he died much of his territory was recovered by his son Conrad, King of the Romans, thus leaving Italy at peace for a very few years. After the death of Frederick II in 1250 the Ghibellines were supported by Conrad IV of Germany and later Manfred, King of Sicily, while the Guelphs were supported by Charles I of Naples. 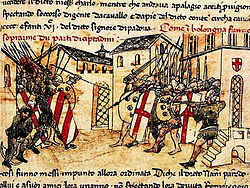 The Sienese Ghibellines inflicted a noteworthy defeat on Florentine Guelphs at the Battle of Montaperti (1260). After the Hohenstaufen dynasty lost the Empire when Charles I executed Conradin in 1268, the terms Guelph and Ghibelline became associated with individual families and cities, rather than the struggle between empire and papacy. In that period the stronghold of Italian Ghibellines was the city of Forlì, in Romagna. That city remained with the Ghibelline factions, partly as a means of preserving its independence, rather than out of loyalty to the temporal power, as Forlì was nominally in the Papal States. Over the centuries, the papacy tried several times to regain control of Forlì, sometimes by violence or by allurements. The division between Guelphs and Ghibellines was especially important in Florence, although the two sides frequently rebelled one against the other and struggled for power in many of the other northern Italian cities as well. Essentially the two sides were now fighting either against German influence (in the case of the Guelphs), or against the temporal power of the Pope (in the case of the Ghibellines). In Florence and elsewhere the Guelphs usually included merchants and burghers, while the Ghibellines tended to be noblemen. They also adopted peculiar customs such as wearing a feather on a particular side of their hats, or cutting fruit a particular way, according to their affiliation. The struggle between Guelphs and Ghibellines was also noticeable in the Republic of Genoa, where the former were called "rampini" (lit. : "grappling hooks") and the latter "mascherati" (lit. : "masked"), although there is no clear etymology for these names. Genoese families like Fieschi and Grimaldi conventionally sided with the Guelph party, in contrast with the Doria and some branches of the Spinola families. While Genoa was often under Guelph rule in the early years of the 13th century, in 1270, Ghibellines Oberto Spinola and Oberto Doria managed to revolt against Guelphs and started a dual government which lasted a couple of decades. In the meanwhile, Guelph families fled to their strongholds east (Fieschi) and west (Grimaldi), but were forced to cease their resistance with several military campaigns, which ended with their readmission to the Genoese political life, after paying war expenses. After the Tuscan Guelphs finally defeated the Ghibellines in 1289 at the Battle of Campaldino and at Vicopisano, the Guelphs began infighting. By 1300 the Florentine Guelphs had divided into the Black and White Guelphs. The Blacks continued to support the Papacy, while the Whites were opposed to Papal influence, specifically the influence of Pope Boniface VIII. Dante was among the supporters of the White Guelphs, and in 1302 was exiled when the Black Guelphs took control of Florence. Those who were not connected to either side, or who had no connections to either Guelphs or Ghibellines, considered both factions unworthy of support but were still affected by changes of power in their respective cities. Emperor Henry VII was disgusted by supporters of both sides when he visited Italy in 1310. In 1325, the city-states of Guelph Bologna and Ghibelline Modena fought over a civic bucket in the War of the Bucket, where the famous Battle of Zappolino was fought. Modena's victory in this battle, and therefore the war, led to a resurgence of Ghibelline fortunes. In 1334 Pope Benedict XII threatened people who used either the Guelph or Ghibelline name with excommunication. In Milan, the Guelphs and Ghibellines cooperated in the creation of the Golden Ambrosian Republic in 1447, but over the next few years engaged in some intense disputes. After the initial leadership of the Ghibellines, the Guelphs seized power at the election of the Captains and Defenders of the Liberty of Milan. The Guelphic government became increasingly autocratic, leading to a Ghibelline conspiracy led by Giorgio Lampugnino and Teodoro Bossi. It failed, and many Ghibellines were massacred in 1449, while others fled, including the prominent Ghibelline Vitaliano I Borromeo, who was sheltered in his County of Arona. Public opinion turned against the Guelphs, and in the next elections the Ghibellines were briefly victorious, but deposed after imprisoning Guelph leaders Giovanni Appiani and Giovanni Ossona. After Francesco I Sforza was made Duke by Milan's senate in 1450, many Ghibellines who had fled such as Filippo Borromeo and Luisino Bossi were restored to positions of prominence in Milan. In the 15th century, the Guelphs supported Charles VIII of France during his invasion of Italy at the start of the Italian Wars, while the Ghibellines were supporters of emperor Maximilian I, Holy Roman Emperor. Cities and families used the names until Charles V, Holy Roman Emperor, firmly established imperial power in Italy in 1529. In the course of the Italian Wars of 1494 to 1559, the political landscape changed so much that the former division between Guelphs and Ghibellines became obsolete. This is evident with the election of Pope Paul V (1605), the first to bear the "Ghibelline" Reichsadler in chief on his Papal coat of arms. On 25 March 2015, the Parte Guelfa was reconstituted as Christian order and archconfraternity to serve the Catholic Church and the Catholic Archdiocese of Florence, guided by the Captains Andrea Claudio Galluzzo, Riccardo Mugellini, Tommaso Conforti, Nicola Biagi and Gabriele Malquori under the custody of Consul Luciano Artusi. The Mayor of Florence established the headquarters of the reborn Guelph Party in the historic Palazzo di Parte Guelfa in the city. During the 12th and 13th centuries, armies of the Ghibelline communes usually adopted the war banner of the Holy Roman Empire —white cross on a red field—as their own. Guelph armies usually reversed the colors—red cross on white. These two schemes are prevalent in the civic heraldry of northern Italian towns and remain a revealing indicator of their past factional leanings. Traditionally Ghibelline towns like Pavia, Novara, Como, Treviso and Asti, continue to sport the Ghibelline cross. The Guelph cross can be found on the civic arms of traditionally Guelph towns like Milan, Vercelli, Alessandria, Padua, Reggio and Bologna. Some individuals and families indicated their faction affiliation in their coats of arms by including an appropriate heraldic "chief" (a horizontal band at the top of the shield). Guelphs had a capo d'Angio or "chief of Anjou", containing yellow fleurs-de-lys on a blue field, with a red heraldic "label", while Ghibellines had a capo dell'impero or "chief of the empire", with a form of the black German imperial eagle on a golden background. Ghibelline swallow-tailed merlons of the "Casa di Romeo", of the Montecchi family of Verona. ^ Ippolito, Antonio Menniti (2005). Treccani (ed.). Guelfi e Ghibellini. Enciclopedia dei Ragazzi (in Italian). ^ Jacques, Tony (2007). Greenwood Publishing Group (ed.). Dictionary of Battles and Sieges: A-E. Enciclopedia dei Ragazzi. p. 209. Chisholm, Hugh, ed. (1911). "Guelphs and Ghibellines" . Encyclopædia Britannica. 12 (11th ed.). Cambridge University Press. pp. 668–669. ^ Gori - Martini (1967). La liguria e la sua anima. Savona, Italy: Sabatelli. ISBN 8875451893. ^ Haegen, Anne Mueller von der; Strasser, Ruth F. (2013). "Between Papacy and Empire – the Interminable Conflict between Guelphs and Ghibellines". Art & Architecture: Tuscany. Potsdam: H.F.Ullmann Publishing. p. 66. ISBN 978-3-8480-0321-1. ^ A History of Milan under the Sforza. Cecilia M. Ady, Edward Armstrong; Methuen & Co., 1907. ^ Tolfo, Maria Grazia; Colussi, Paolo (January 23, 2009). "Storia di Milano ::: dal 1426 al 1450" [History of Milan ::: from 1426 to 1450]. Storia di Milano (in Italian). Milano: Storiadimilano. Retrieved May 6, 2010. ^ The Complete Book of Heraldry by Stephen Slater (ISBN 1843096986), page 201. This article incorporates text from a publication now in the public domain: Gardner, Edmund Garratt (1910). "Guelphs and Ghibellines" . In Herbermann, Charles (ed.). Catholic Encyclopedia. 7. New York: Robert Appleton. Faini, Enric (2006). Il convito del 1216. La vendetta all'origine del fazionalismo fiorentino (PDF). Annali di Storia di Firenze (in Italian). University of Florence. Machiavelli, Niccolò (1532). History Of Florence And Of The Affairs Of Italy From The Earliest Times To The Death Of Lorenzo The Magnificent.